Every moment counts in an emergency, so rapid response and first aid are critical when assisting people involved in first aid situations. Beach Emergency Numbers (BEN) signs are primarily located at beach access points and feature a unique code along with specific location information, which is vital for emergency services. By calling 000 and reporting the unique beach number, emergency services can quickly respond to the exact location detailed on the sign. First Aid training and the correct first aid kit will assist you to stabilise a patient and assist in a range of ocean emergency situations. A selection of affordable first aid kits and specialist tourniquets are available, including a range of marine-grade tourniquets for scuba divers and surfboard models which are integrated into the ankle leash. While the application of a tourniquet may be useful in some trauma events, approved first aid training is critical to maximise your ability to assist in an emergency. 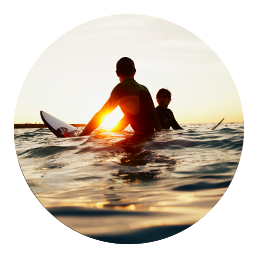 There are a number of providers offering beach-friendly first aid training and tourniquet advice, including Surf Life Saving WA (SLSWA), St John Ambulance and Surfing WA, which has developed a free training program specifically designed for surfers – Surfers Rescue 365. When an emergency involving a serious shark incident occurs, Water Police act as the first point of call and activate the relevant responders. WA Police (Water Police) is the Hazard Management Authority for marine search and rescue in Western Australia, and act as the lead agency to receive calls and coordinate search and rescue operations from its base in North Fremantle. Sea search and rescue operations are undertaken with Department of Fire and Emergency Services Marine Volunteers, Department of Transport, SLSWA and Local Governments. When requested, the Department of Primary Industries and Regional Development (DPIRD) provides operational support to response agencies, and monitoring following a shark incident. Land managers such as local government beach inspectors, rangers or security may respond to information of an incident and close beach car parks, put up beach closed signs or inform water users. Follow any beach closures in place and take additional caution in the area. It’s a good idea to always check for the latest information available on the shark activity map and take responsibility for making a smart decision about your water use. DPIRD has protocols and procedures to prepare for, and respond to, serious threat incidents. This includes a network of regionally placed assets which can assist in monitoring an area after a shark bite incident. The Serious Threat guidelines were revised in October 2018, and drum lines will no longer be set pre-emptively, or automatically deployed in response to shark incidents. The revised guidelines are not definitive as it is recognised that every situation where they may be applied is likely to be different, and as such, judgement will need to be exercised based on the available information. However, in exceptional circumstances, such as a serious or fatal shark attack, the Deputy Director General, Sustainability and Biosecurity, DPIRD may issue an order to capture a shark in order to relocate or take the animal, if other measures have failed to address risks to public safety. Publicly available guidelines outline when this may occur. This could include where a shark remains in a localised area and all attempts to relocate or remove the shark have been unsuccessful, and the presence of the shark remains a genuine threat. In exercising the powers, the Deputy Director General will place public safety as the first priority.